Dogbane (Apocynum cannabinum) is the representative species for the dogbane family, Apocynaceae, which includes milkweeds and other plants that ooze milky sap ladened with poisonous alkaloids. Indeed, Apocynum translates to "poisonous to dogs," or "dog killer." Sap from the plant is reported to have been used against ravenous feral dogs. However, it apparently has no effect on werewolves; that's Wolfsbane (Aconitum spp., family Ranunculaceae). Yet another example of the value of knowing plant taxonomy and being able to make an accurate plant ID ... as though your life depended on it. I recently came across two insects that specialize in feeding on dogbane. The so-called Dogbane Beetle (Chrysochus auratus) should be familiar to BYGL readers; we've reported on it in the past. However, the Dogbane Webworm (Saucrobotys futilalis) was totally new to me; I had never come across this caterpillar nor had I heard of it before. This is one of the most beautiful insects found in Ohio. 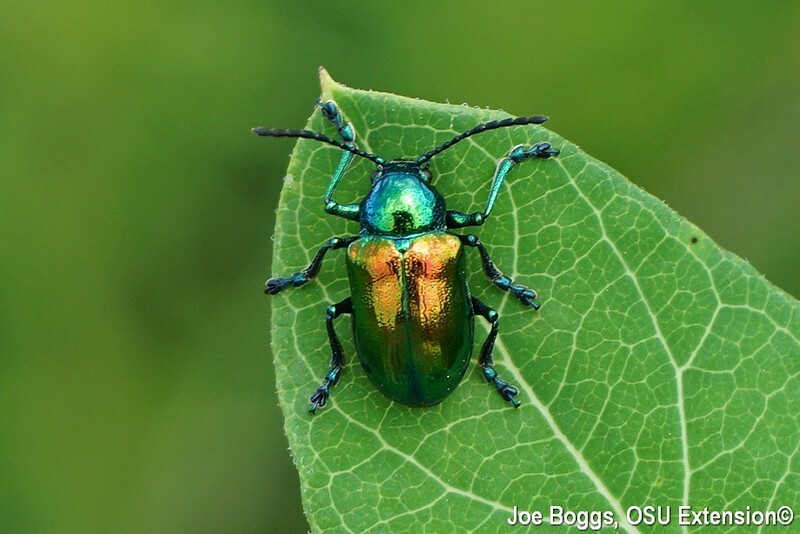 The iridescent beetles may look like gleaming spots of gold on the leaves of dogbane, or with a slight change in viewing angle, they will glisten with multiple shades of green, copper, blue, and red. The secret to the myriad display of colors can be found just below the surface of the exoskeleton. Beneath an outer translucent layer rests stacks of tiny slanting plates that cover color pigments. Light rays striking the surface of the plates are reflected as a shimmering sheen, while light rays that bounce off the pigments produce colors. The result is a lustrous mix of ever-changing hews; a kaleidoscope of colors that are almost unmatched in the insect world. The beetles are found during the day feeding and resting on dogbane leaves. They are not picked-off by predators because of their nasty chemical defense strategy. The beetles ingest the poisonous alkaloids (cardiac glycosides) in the dogbane sap, store the chemicals in specialized glands, and then secrete them when threatened by predators. This is different from the chemical defense strategy employed by other insects that feed on milkweeds. However, the results are the same with their bright coloration advertising their ability to wage chemical warfare against predators. This is known as "aposematic" coloration which means warning coloration. When I first saw the webbed nests, I thought they were Fall Webworms (Hyphantria cunea). After all, fall webworms may be found on a wide range hosts including trees and shrubs as well as some agricultural crops. However, I had never seen fall webworm on any member of the Apocynaceae family. Presumably, the caterpillars are not capable of handling the alkaloid chemical defenses of plants in this family. Of course, a closer inspection revealed two characteristics beyond host selection that defined these webworms as being a different species. Unlike fall webworms that envelope groups of leaves in silk, the dogbane webworms use silk to knit leaves together; the leaves appear to be furled around the stem. Of course, the second feature is the caterpillars themselves; dogbane webworms are not hairy. The webworms only feed on their namesake host. Apparently, the caterpillars incorporate the alkaloid toxins derived from their host into their flesh to ward off predators. However, research has shown they don't "advertise" their toxic nature until they become large enough to be noticed by natural enemies. Early instars are green which provides camouflage as they feed inside the furled leaf-nests. The caterpillars develop black spots and become progressively more orange in color as they grow larger and more exposed as they consume more of the protective leaves furled around their silk nests. The orange and black aposematic coloration lets predators know they are not good to eat. Dogbane webworms have multiple generations per season, so they could presumably build substantial populations. I will be watching my "local stock" to see if this occurs as the season progresses.